In order to update its facilities, the City of Columbus’s Southerly Wastewater Plant and Com-til Facility required asbestos abatement, environmental remediation, and selective and structural demolition of several buildings that had become obsolete for their operations. Precision Environmental Co. was awarded to complete this prime contract for the city. 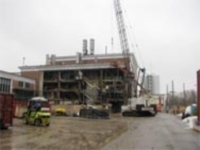 The largest component and most daunting task of the project required the removal of over 1,000 cubic yards of asbestos-containing insulation and PCB contaminated refractory and residual ash from two abandoned Nichols-Herreshoff multiple-hearth incinerators. The incinerator units had not been operational for several years, and along with their surrounding building structure, they needed to be dismantled down to the existing concrete foundation. To further accommodate this, critical plant processing, mechanical, and electrical systems needed to be re-routed to other locations. 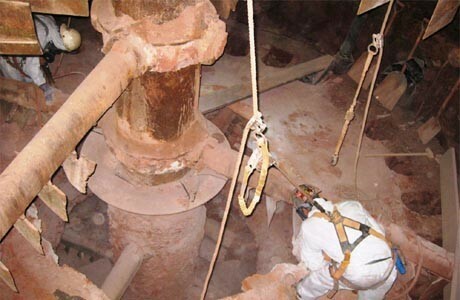 The other contract work included: the removal and replacement of 10,000 sf built-up roof system, dismantling and salvage of six abandoned 15-ton sludge processing centrifuge units, selective demolition and recycling of 300 tons of abandoned composting equipment and 800 tons of concrete storage bins, and installation of an 8 inch 11,000 square feet concrete slab. Remediating the incinerator stacks presented a unique set of challenges for Precision. The two stacks – full of asbestos, heavy metal, and PCB contamination – were 50 feet tall with diameter of 20 feet and constructed of eight poured or brick refractory hearths. Due to being abandoned and the intricate construction of the incinerators, their structural integrity was questionable and required many hours of design work led by Precision and several consultants to engineer safe work practices and sequence activity to work within them. All of the hazardous materials were removed by hand as designed and the incinerators and complex building dismantlement was completed without incident and with a foundation ready to construct the new building on. This job was a prime example of Precision’s ability to lead a complicated project requiring several different trades and tasks. Asbestos abatement, environmental remediation and selective demolition of a building structure while saving basement on an abandoned building with two Nichols Herreshoff multiple-hearth incinerators.